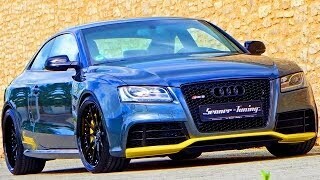 The German aftermarket specialists Senner Tuning has released an upgrade program for the Audi S5 Coupe. The tuning program includes a new RS look front apron with RS5 radiator, carbon elements in red for the large air inlets of front aprons, external mirror an side skirts made of carbon fibre, number plate illuminated by bright LEDs and alloy wheel rims lightened up in powerful flash red. Continuing on the interior, Dark carbon of the 600 series contrasts the red-black bi-coloured Nappa leather fitting and decorates the dashboard, centre console, door lining including RS5 door handles and the sports steering. The factory-built Audi multimedia system now plays DVD films. The Senner Audi S5 2014 is powered by the 3.0-liter supercharged V6 engine, which after up-gradation is now producing a total output of 328 KW / 446 horse power and a maximum torque of 511 Nm. 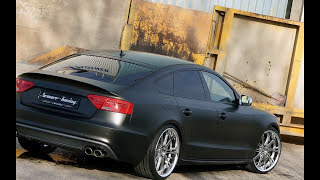 The Senner Tunning Audi S5 is priced at EUR 64,900 gross (EUR 54,537 net, VAT stated separately).